On May 3, 2017, the exhibition “Circus. Freiheit. Gleichschaltung” (Circus. Freedom. Forced Coordination) opened at Museum Europäischer Kulturen in Berlin, which we organised in cooperation with the project group “Circus im Nationalsozialismus”. 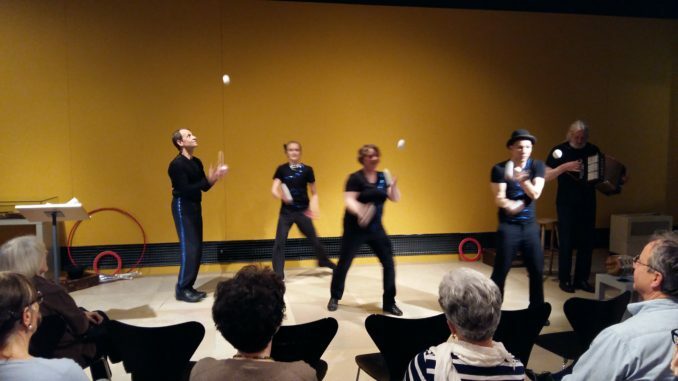 In a lecture performance, extracts of Ingeborg Prior’s book “Der Clown und die Zirkusreiterin” (The Clown and the Circus Rider) about the fate of the German-Jewish artist Irene Bento during the Nazi period were read and visualised with interpretive circus acts like juggling and pantomime. Furthermore, the most important Nazi regulations concerning circus life in Germany between 1933 and 1945 were introduced to the audience, including forced coordination, aryanisation, and the repression of foreign influence.